Hi friends! It's Shelbi here with exciting news - with Wedding Season upon us I am kicking off a Wedding Season series this month, before everything gets to hectic and unorganized. I will show you some of the best gift guides, style guides, how to congratulate the bride and groom and more. Today's Topic: A 20 Something's Survival Guide, a little bit of an overall view of some of the things that will be focused on during this months series. If your friends are anything like mine the domino effect is in full force and once 1 tips, there they all go, getting engaged one after another. I want to show you how to have the most fun while still keeping your bank account intact. So with that in mind, let's get down to business. Enjoy! 1. The Engagement: Currently, most everyone is sharing their news via social media, but if you happen to be one of the few that receive a call, text or e-mail... you are on their mind during this exciting time in their life! That being said, they should be on your mind. A cute gift basket containing Bridal Magazines, a cute new monogram cup and some champagne should do the trick, and don't forget to put a card with it! This way, you get to see and wish the new soon to be Mrs. warm wishes before all the chaos begins and get to take a look at the girl sporting her new sparkler. 2. Travel: In the past few years the cost of wedding's are going up and up... especially when these events are turning into week long social events. While this makes for a great time, it also makes for a large dent in your bank account... missing work doesn't really help either. A few nights of hotel costs and air fares can add up quickly, so to save up and make sure that you're having as much fun as possible...stack up! Bring girlfriends or couple friends, either way the more the merrier and the smaller cost! Who wouldn't want to relive that trip that has been playing in your dreams for the past 6 months? Use this wedding as personal vacation with a little bit of preplanned activities placed on the itinerary! 3. The Gift: Think of a registry as a 60% sale at your favorite store... the earlier you get there, the better luck you have skimming through all of the items. Waiting until the week before might leave you purchasing an unreasonably priced soap dish or having to branch from the registry because the affordable items are gone. So come early or bring a friend, either way make it a priority! Bringing a friend (or friends) is a smart way to go...especially if you will be traveling together. With everyone pitching in you might be able to get that mixer or soap dish that before you couldn't afford. If you are close friends with the Bride and Groom going personal is always appropriate! 4. What to Wear: In every woman's World deciding what to wear is harder than it should be... but going to a wedding with 521± friends that you haven't seen since college can feel like one of the biggest decisions in your life. With resources like Rent The Runway you are able to spend less for more and still be able to splurge on little things that can be warn more frequently. 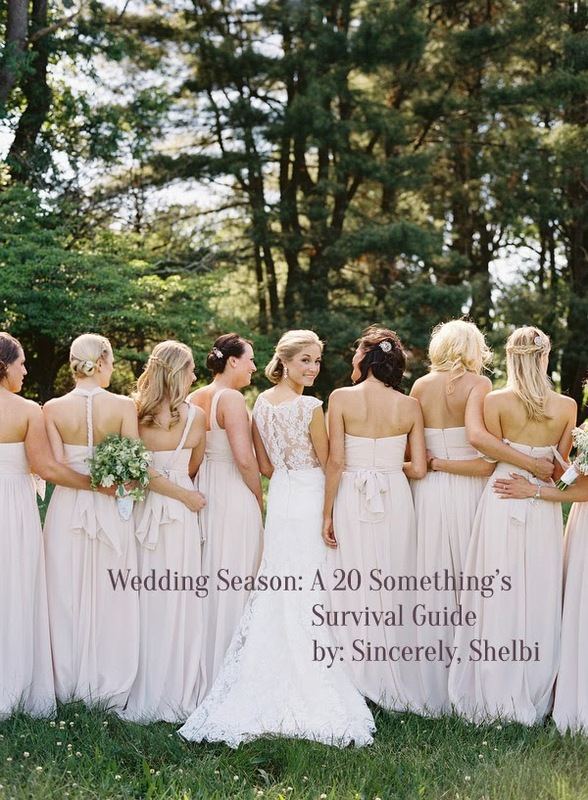 Do you have any tips for Surviving a Wedding?